« Thai Avocado Sauce…Thai Guacamole! The pineapple, or ananas, is yet another native of Central and South America that found its way across the globe. Its stunning beauty, exotic color, and exquisite flavor became a symbol of hospitality in the English colonies to the north and across the Atlantic. Fast forward to Hawaii in the early 20th century where the Dole Pineapple Company developed a commercial pineapple farming and canning method that quickly transformed the pineapple into a legendary “ pop” icon of American baking. The following recipe does not veer far from the Dole pineapple upside down cake recipe contest winner’s 1926 recipe that put pineapple upside down cake on tables across America and around the world. I’ve adjusted quantities slightly, added alternative ingredients, and…why not add a splash of rum as an irresistible nod to the pineapples Caribbean roots! Grease the sides of the cake pan with butter. Melt 2 tablespoons of butter and pour it into the bottom of the cake pan and sprinkle the brown sugar evenly over the butter. 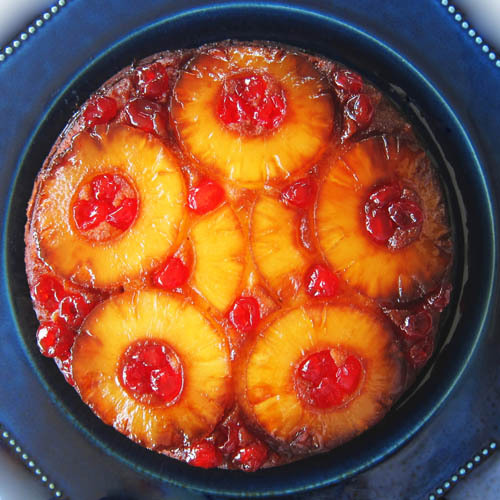 Splash the rum (if using) over the surface and arrange the pineapple slices in the pan in a circular pattern, adding the cherries in the center of each round and a few in the in between. Set aside while you make the cake batter. Sift the flour, baking powder, baking soda, and salt into a bowl. Stir to combine and set aside. Cream 1/2 cup butter with an electric mixer until fluffy, adding the sugar as you mix until combined. Add the egg yolks and mix until combined. With the mixer running add the flour mixture, buttermilk, and pineapple juice alternately while mixing until well combined. The batter will be quite dense. Beat the egg whites until soft peaks form and fold into the batter along with the vanilla until incorporated. Spoon the batter over the pineapple and, using a spatula, spread it out evenly to the edges of the pan. Transfer the pan to the center of the preheated oven and bake about 30 to 35 minutes. To test, insert a thin skewer into the center of the cake. If it comes out clean the cake is finished. Remove the cake from the oven and allow it to sit for a minute or two before running a knife around the edge of the pan. If the cake has risen up in the center use a large serrated knife to level it off. Place a plate over the pan and flip it upside down, releasing the cake onto the plate. Put 4 ½ teaspoons fresh lemon juice in a glass measuring cup and add enough milk to make one cup. Stir and let stand for 15 minutes. The milk will have curdled and thickened and ready to use.